ST. CLAIRSVILLE — River’s not short on confidence. When a roster is loaded with seniors and experience, there’s no need to hit any type of panic buttons at any point. 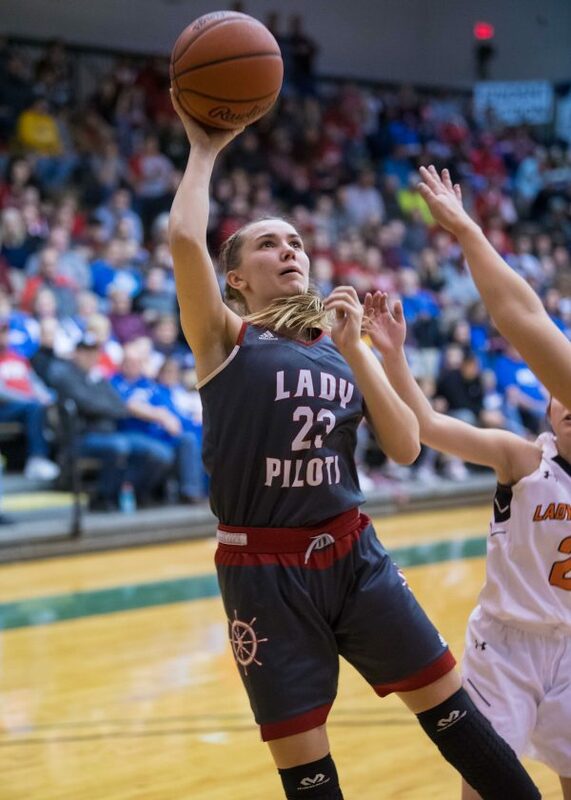 And that includes when the Pilots were down 11 early in the fourth quarter to top-seeded Shadyside Saturday evening in the Class 2A portion of the Wheeling Hospital OVAC Girls Basketball Championships at Ohio University. The Pilots did nothing but proceed to take the game over in the fourth quarter where they outscored the Tigers, 27-10, to go on for a hard-earned and cherished 55-49 win over the top-seeded Tigers. The Pilots not only showed the grit, will and determination that comes with an experienced team that’s a defending conference champion. They also broke out their press, which they hadn’t showed for most of the game. Quite simply, Shadyside couldn’t handle the Pilots’ pressure. The Tigers were guilty of seven turnovers in the fourth quarter, many of which were of the live-ball variety and resulted in run-out opportunities for the Pilots. Fueling those run outs was senior standout Lauren Flannery. The future Lake Erie College point guard scored eight of her 23 points in the fourth. She actually ignited a fourth-quarter in which the Pilots scored 27 points after having just 28 through the first three periods. “Before the fourth quarter, I told the other seniors that this was our last chance and we had to leave it all out on the court,” Flannery, who was named the winner of the John Howell MVP Award, said. Flannery actually ignited the fourth-quarter spurt on both ends. She got two layups and then — after a Pilot turnover — raced back down the court and blocked a shot. That ignited not only the droves of Pilot faithful, but also her teammates. “Shadyside called a time out and you could tell they were frustrated, so we knew we had to continue to take advantage of that,” Flannery continued. The initial River onslaught was a 13-2 run that knotted the game at 41 with 4:12 to play. Shadyside took the lead back at 44-43 on an inside basket from Macy Coffland. The Tigers’ lead was short-lived, however. Alli Long and senior Candace Caldwell, who was big throughout with 15 points, scored on back-to-back possessions, putting River back in front, 47-44. The Tigers could only get as close as one the rest of the way. The Pilots held the Tigers at bay thanks to a sharp 12-of-16 effort at the foul line in the fourth quarter. Gentile, who watched his team finish the regular season with an 18-4 record, could really only shake his head. Caldwell, who Isaly said “came up huge,” finished with 15 points in support of Flannery. Senior Carsyn Reynolds added eight. The Tigers, who led 19-15 at halftime, were led by Coffland’s 12 points. Senior Jaycee Mayeres, sophomore Baylee Wach and sophomore Tory Hendershot all evenly divided 24 points. Shadyside is off until opening tournament play on Feb. 21 against Malvern.